Anne welcomed all present participants as well as the newcomers for the second day of the leadership school and launched the first session of the day. The first session started with a keynote presented by Primiano Augelli from PWC. He highlighted the corporate view of the importance of acquiring new skills and then presented the way his firm is dealing with competence and skill development. In the current context, where changes are so rapid, the stake for the transformation is high. He explained that it is very difficult to do predictions as the future is not what it used to be. He confirmed that also smart guys make wrong predictions by providing the example that in the early 80s they predicted that there would be less than 1 million cell phones by 2000. Deborah Arnold then started the discussion panel and gave the floor to Laura Bertrand from Pole Leonard De Vinci. She presented a brief description of Group Leonard de Vinci. It is a business school, engineering school and school of web design and multimedia. They have a big digital focus, their DNA is transversality and hybridation. In November 2015, they created a department of soft skills to meet the expectations of the companies and handle the revolution that students will face in the future in a more digitized world, and to develop soft skills. Average student satisfaction rate of soft skills is 80 %. They also have strong positive feedback from partners and parents and positive media interest and coverage. The following talk was presented by Carla Lojacono from University of Palermo in the domain of soft skills for students. She claimed that there is a skill shortage and lack of connection between student soft skills and those required by employers. She confirmed that these skills affect the salary. She highlighted the differences between the point of view of the educational sector that believes that students have skills and the employer sector that believe that students lack these skills. Keywords: digital revolution, soft skills, digital soft skills. 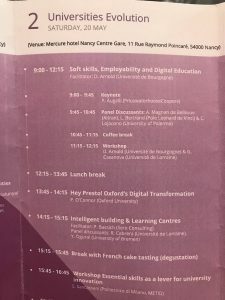 After the Lunch break P.O’Connor made an introduction to the main points and difficulties they are finding to carry out the digital transformation at Oxford University. The stake of the transformation is high since they have to balance between the value of traditional forms of teaching and the performance of modern forms of learning/teaching. 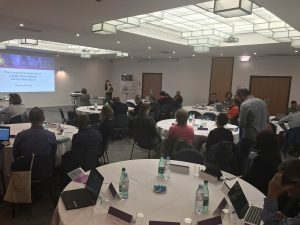 To solve the problem, they decided to implement a series of measures involving communication, setting priorities, providing the tools and the help, and capitalising on passion for teaching. In their strategy, they also made a big effort to implement programs for student pacing, bridging the gap between school and university, and including open education and tutorials. And then it was the time to talk about learning physical spaces. P. Bacsish facilitated the following session about Intelligent building and learning centres. Then, It was the turn for Yildiray Ogurol from University of Bremen to talk about the transformation process in his institution which provides many services for e-learning including: LMS, one of the largest e-assessment in Germany, and a media service which supplies infrastructure for lectures production. The different buildings have been provided with multimedia learning rooms for students, which can be booked through the LMS, whose main objective is to facilitate the collaborative learning. The latter rooms, fully equipped with screens, computers, whiteboards and mediaboxes, were object of an evaluation study with a very positive feedback from students. A delicious french cake tasting, with the traditional “macarons” among others marked the end of the Intelligent building and learning centres session. 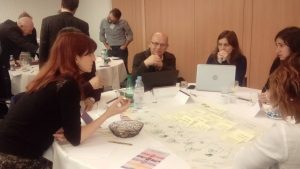 Immediately after the break, a workshop about essential skills as a lever for university innovation took place, and the assistants were invited to play the role of decision makers in order to define a strategy to carry out the digital transformation of their HE institutions. The third session of the meeting was facilited by Angela Procoli (FMSH) and Denes Zarka (Budapest University of Technology and Economics). Stylianos Hazipanagos (kings college) opened the session with a presentation entitled from ‘distance’ to ‘digital’ to ‘open’: the changing landscape of higher education and implications for strategy and leadership. The talk consisted in a very detailed review of the multiple points which can be included in a strategic plan to support technology (TEL stragegy) through the learning process in a HE institution, along with the pros and cons and the difficulties which can be encountered during the implementation. For instance, the usefulness of a good LA to investigate and visualise large institutional data sets in the service of improving learning; the importance of evaluation plans, making use of measures, standards of quality, benchmarking, rubrics, etc. when implementing online lectures; taking into account all dimensions of ODL when deciding about autonomous models or collaborative ones (like consortia); take a close look at the existing TEL strategy, practices and technology, when designing a MOOC. Tian Belawati (Rector of Universitas Terbuka) carried on with the session’s subject showing the example of the Open University of Indonesia. She demonstrated to us that a complete digital educative open university is not only possible, but the best way to widen access altogether with good quality learning standards and high success rates among the students. The context of this institution is very particular, as Indonesia is a country with a very low level of HE and also of internet penetration (around 50% for the latest). Since 1995, this dynamic institution has been continuously evolving to provide a growing number of distant technological learning services such as online tutorials, online self test exercises, an internet TV, an office 365 for students, and many others. More than one thousand learning resources are at students’ service and face to face materials are available on demand. Lately they tried to solve the problem of the low internet availability by offering a free internet access to students and they are currently implementing an online tutors program. The future is not something we enter but something we create!